Two activists with the SAC syndicalist union in Sweden write on the “Peace Obligation” proposal which would effectively outlaw strikes and workplaces actions outside of narrow conditions. The piece explains both the political context for the proposal – crafted jointly by employers and major unions and backed by the Social Democratic Party – as well as the the resistance led by a coalition of independent unions and activists. The resurgence of – true or self-proclaimed – socialist movements in the Global North has implied very generous interpretations of life in the Nordic countries. Sweden, in particular, has often been hailed as a model for the “democratic socialism” espoused by Bernie Sanders and others. It is true that the legacy of Sweden’s strong working-class movement and social-democratic governance makes the welfare state somewhat more resilient than in other countries. Sweden still enjoys a relatively high level of unionization, government funding for equal opportunities in education, employment, and the arts, universal health care, free education, and so forth. Sweden also ranks high when it comes to the implementation of the rights of women and LGBTQ people, it has relatively liberal immigration policies, and it dedicates an above-average percentage of its GDP to development projects in the Global South. All of this rightfully appeals to people embracing socialist values of equality and internationalism. But Sweden has been marked by the neoliberalist era as much as any other country. In the 1990s, the Social Democratic Party – which has been governing the country, with short interruptions, since the 1920s – embraced New Labour-type policies, privatizing huge parts of the public sector, including clinics, schools, postal services, the transport system, and council flats. The center-right government that ruled the country from 2006 to 2014 accelerated these developments. In Stockholm, the percentage of council flats in available housing dropped from 75% in 1990 to 45% in 2015. Prices on the private market have skyrocketed, which has reshaped the city’s entire social fabric. Across the country, eligibility for unemployment and invalidity benefits have been cut substantially. And the once powerful unions have been losing much influence, not least due to large economic sectors being absorbed by the gig economy (from delivery, cleaning, and catering to cultural, academic, and IT work). If any further proof was needed both for the misperception of Sweden as a quasi-socialist country, the increasing attacks on the workers’ movement’s achievements, and the class betrayal of the Social Democratic leadership, it has been delivered by a June 2018 proposal to rewrite important sections of Swedish labor law. The proposal carries the title “Peace Obligation at Workplaces with Collective Bargaining Agreements, and in the Case of Litigation.” It was conceived in a joint effort by the Confederation of Swedish Enterprise and the country’s biggest trade union associations, and turned into a proposal for legislation by the Swedish Ministry of Labor, headed by the Social Democrat Ylva Johansson. In layman’s terms, this renders all forms of industrial action illegal apart from attempts to force employers to sign a collective bargaining agreement if they haven’t done so before – and even in this case, workers and their organizations need to come to the negotiation table first. In order to understand how far-reaching the consequences would be if this proposal was to become law, we need to look at what the Swedish Labour Court has classified as “industrial action” over the years. In a 2005 verdict, the court declared that “basically any action – or lack thereof – that can have an impact on the party against which it is directed, can be considered an industrial action.” This can practically encompass anything. Indeed, we find that in certain cases, the Swedish Labour Court has classified actions such handing out leaflets and writing opinion pieces as industrial actions. If, as the proposal suggests, actions like these will become illegal in connection with pretty much any labor dispute, then out-of-court actions – or mere declarations – of solidarity with workers who have been harassed or discriminated against will become illegal, too. The consequences of violating the legal code are already unevenly divided between capital and labor. According to Swedish labor law, employers can avoid legal proceedings in the case of, for example, unlawful sackings [firings] by offering compensation payments. Workers do not get off that easily. Unions can, for example, be made liable for all alleged losses that employers suffer as a result of unlawful industrial action directed against them. Once almost all forms of industrial action will be outlawed, entire workers’ organizations can be ruined. The “Peace Obligation” proposal is also deceitful. One example concerns the consequences for employment equality. Under the header “Consequences for the Equality Between Men and Women,” the proposal claims that “more men than women” will be affected by it. The reason given is “the division of gender within the transport and construction industries.” Leaving aside the unsettling suggestion that more gender equality can be reached by curtailing the rights of men rather than by extending those of women, this assertion is simply not true. A report by the National Mediation Office – which is regularly cited throughout the proposal – clearly states the opposite: “During the period in question [2000-2016], most cases of such conflict [involving industrial action] occurred among cleaners (about 50), followed by hotel and restaurant workers (about 45), longshoremen (about 35), construction workers (about 30), in the retail business (about 30), and in heavy industry (about 20).” In short, the industries most affected if the proposal becomes law will be industries dominated by women. This stands in glaring contradiction to the proposal’s claims. It is also questionable how the proposal can be reconciled with the International Labour Organisation’s Convention 87, titled “Freedom of Association and Protection of the Right to Organise.” The convention, ratified by Sweden in 1949, requires all ratifying countries “to take all necessary and appropriate measures to ensure that workers and employers may exercise freely the right to organise.” It further states that “the law of the land shall not be such as to impair, nor shall it be so applied as to impair, the guarantees provided for in this Convention.” Now, in practice, the right for Swedish workers to join particular labor organizations will be rendered meaningless if these organizations have no right to act. The conundrum becomes particularly obvious if we look at how “freedom of association” is defined in Article 11 of the European Convention on Human Rights, ratified by Sweden in 1953: “Everyone has the right to freedom of peaceful assembly and to freedom of association with others, including the right to form and to join trade unions for the protection of his interests.” Yes, workers should be able to join trade unions for the protection of their interests, not just for the heck of it. If, as suggested by its authors, the “Peace Obligation” proposal will become law by January 1, 2020, independent unions that have not yet come to power-sharing agreements with the ruling class – or that have no interest in ever signing any such agreements – can no longer act as unions. The syndicalist SAC, for example, opposes signing collective bargaining agreements due to the stipulations that already come with them according to Swedish law, for example non-strike agreements and other restrictions on their activities. If the “Peace Obligation” proposal becomes law, industrial action will pretty much disappear from a country where it already has become rare given the social-democratic institutionalization of the workers’ movement. Since the 1980s, the number of strike days has steadily decreased. In 1986, there were still 682,652 strike days registered. In 2017, there were 329. The SAC, with a modest membership of 3000 people, often tops the annual list. Demonstration for right to strike in Göteborg in December 2018. Source: Proletären. 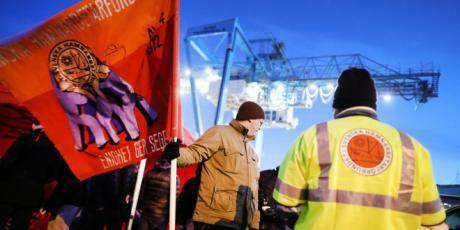 The 2017 strikes at the Port of Gothenburg, led by the Swedish Dockworkers’ Union, are often considered as the events that triggered the “Peace Obligation” proposal. The Swedish Dockworkers’ Union, one of Sweden’s biggest independent unions, has been denied collective bargaining rights since it split from the Swedish Transport Workers’ Union in 1972. This has led to repeated labor unrest at the Port of Gothenburg, Scandinavia’s biggest. The purported loss for Swedish industry caused by the 2017 strikes was estimated at half a billion US dollars. In order to understand how Social Democrats can back such proposals (or, at least, parts thereof), we have to understand how deep class compromise runs in Swedish society. It was first cemented at the 1938 Saltsjöbaden Agreement between the Swedish Employers Association (a forerunner to the the Confederation of Swedish Enterprise) and LO, the biggest of the national trade union confederations and, to this day, strongly tied to the Social Democratic Party. Of particular importance for the current situation, however, was the postwar Rehn-Meidner model, named after Gösta Rehn and Rudolf Meidner, two LO economists. The Rehn-Meidner model was in tune with Keynesian policies of stimulating economic growth and safeguarding political stability through state intervention in fiscal policies and on the labor market. It helped keep inflation low, employment high, and incomes fairly equally divided. But its success very much dependent on the economic boom experienced in Europe post-World War II, and had no provisions for economic crises. This also affected on one of its key aspects, the so-called “solidarity wage policy,” which was to prevent significant differences in wages between industries. Companies that could not maintain the wage levels required by the policy had to shut down, which, in turn, led to a strong concentration of industrial power. At the end of the 1970s, 80 percent of the LO membership worked for but 20 highly profitable companies. It is an often overlooked fact that Sweden is home to some of Europe’s richest and most powerful companies. Today, 10 percent of the Swedish population own 70 percent of the country’s wealth, a figure significantly higher than in most other European countries. In tandem with the diplomatic skills of the country’s politicians, Sweden’s profitable export industry was central for the development of the Swedish welfare state. When, in the 1970s, economic growth started to decline and labor-intensive production began to move to low-wage countries, the Rehn-Meidner model was no longer viable. Increased international competition meant that wages in Sweden’s export-oriented industries could no longer rise at previous rates if massive relocation was to be avoided. The solidarity wage policy was abandoned and export-oriented industries now set the standard for wages in the country. This also increased the power of unions in the export-oriented sector. The metalworkers’ union IF Metall became a particularly powerful player in this context. Both Sweden’s current caretaker prime minister Stefan Löfven and LO president Karl-Petter Thorwaldsson have come up through the IF Metall ranks. While LO and other mainstream union confederations cozy up to business interests – IF Metall, for example, explicitly condemned the strikes at the Port of Gothenburg – there is resistance among the rank and file. However, the rank and file’s powers are limited considering that union leaders disapprove of any public critique of the “Peace Obligation” proposal, let alone protest actions. But resistance by independent unions and activists is on the rise. Led by a coalition called “Strike Back,” several demonstrations and direct actions have taken place across the country since the summer. On August 25, 2018, two thousand people gathered in Stockholm for a day of action that included marches, blockades, and a rally outside the LO headquarters. But make no mistake: The significance of this conflict is by no means limited to Sweden. The reason that the rights of Swedish dockworkers, along with those of independent unions, are under attack has much to do with the increased significance of logistics in a capitalist system, in which global chains of production and just-in-time manufacturing have become essential. The Gothenburg strikes struck at the core of neoliberal capitalism. Capital, in Sweden and beyond, desperately wants to prevent ripple effects. Laws such as the ones laid out in the “Peace Obligations” proposal can become a blueprint for similar legislation in other countries. We are entering a new phase of international class struggle. Gabriel Kuhn and Micke Nordin are Central Committee members of the syndicalist Sveriges Arbetares Centralorganisation (SAC) [Follow SAC on Twitter]. This article was originally published at CounterPunch under the headline “Class War in Sweden”, and was also republished via the Black Rose/Rosa Negra Anarchist Federation. If you want to read further commentary on history and current state of social democracy in western Europe we recommend the excellent piece “If You Want a Better Capitalism”: An Interview on Social Democracy with Gabriel Kuhn.